Actors have become much mature especially when dealing with memes created surrounding them and sometimes they never satire or slightly make fun of their hard work. Jayam Ravi is a cool person as we know through many interviews and he proves it again. 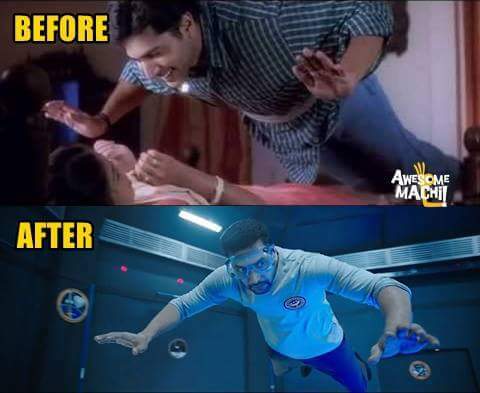 As soon as the trailer for Tik Tik Tik got launched, a viral meme went online that showed Jayam Ravi hanging from the wall in the movie Jayam and suspended in air in the latest sci-fi flick. It read Before and After that made him burst into laughter. “Epdilam yosikuranga” said Ravi who enjoyed various memes made on him and the teaser that has garnered over 2 million views already.